POSITAL has added a new communications interface to its Dynamic TILTIX series of tilt sensors. The key to this remarkable dynamic performance is the addition of a second measurement system to the MEMS accelerometers used in conventional tilt sensors. An electromechanical gyroscope system was added to measure rate of rotational in the different axes. This eliminates the central shortcoming of conventional inclination sensors, where sudden accelerations or vibrations cause inertial loads in the accelerometers, adding noise to the output signals - and errors to the tilt angle readings. Signals from the accelerometer and gyroscope are combined by innovative algorithms to filter out the errors caused by acceleration loads so that the actual inclination is reported accurately. "What sounds so simple proved to be very time-consuming and labor-intensive in terms of practical implementation," emphasizes Tobias Schubert, product manager responsible for POSITAL's TILTIX inclination sensors. "We invested almost three years in the development of the algorithm alone. We worked extensively with pilot customers to assure ourselves that these instruments would work reliably under the harshest field conditions." 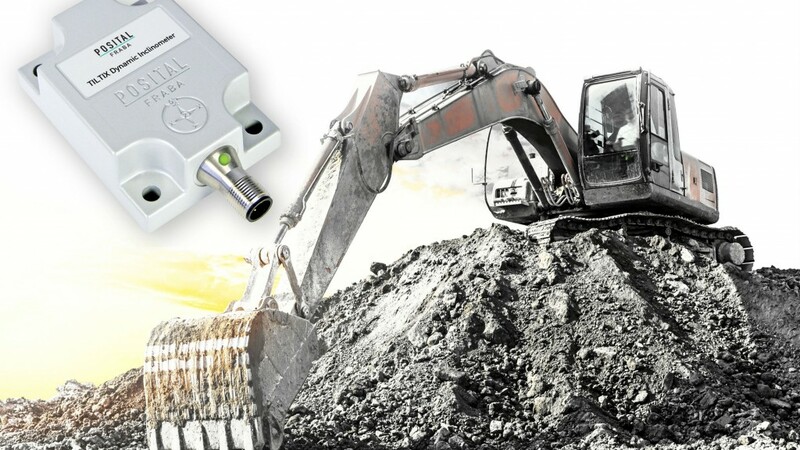 The Dynamic TILTIX sensors are ideal for use in heavy-duty mobile machinery such as construction equipment, cranes, agricultural machinery and mining equipment. In addition to improving operational safety, they also ensure tangible time and cost savings - for example, with excavators that used inclinometers to measure arm positions, it was necessary to pause work repeatedly to allow the instrument to ‘settle' and generate clean readings. With the dual measuring system, which guarantees reliable inclination measurement, even under rapid motion, these time-wasting interruptions can be eliminated. These systems, in addition to providing precise inclination measurements, also detect accelerations and rates of rotation in all three axes. This means that additional features and applications can be implemented with the Dynamic TILTIX sensor. This includes, for example, the monitoring of complex motion sequences on container bridges or in spreaders. "In the future, we see genuine potential in the area of 'autonomous driving', including off-highway applications such as in agricultural machinery ", says Schubert. "When cornering, for example, the GPS signal can be corrected by considering the rate of rotation around the vertical axis." Dynamic TILTIX sensors, which are suitable for horizontal and vertical mounting, have a measuring range of ± 180°. Measuring and signal processing components are contained in a heavy-duty die-cast aluminum housing, and can withstand shock loads of up to 100 g. The packaging has a protection class rating of IP69K. Dynamic TILTIX sensors achieve a static accuracy of ± 0.3°, a dynamic accuracy in the moving system of 0.5° and a resolution of 0.01°. They're also easy to install, requiring only four mounting bolts and a connector cable. This is a plus for retrofit situations.